"Baseballs" redirects here. For the German rock'n'roll cover band, see The Baseballs. A baseball is a ball used in the sport of the same name. The ball features a rubber or cork center, wrapped in yarn, and covered, in the words of the Official Baseball Rules "with two strips of white horsehide or cowhide, tightly stitched together." It is 9–9​1⁄4 inches (229–235 mm) in circumference (​2 55⁄64–​2 15⁄16 in. or 73–75 mm in diameter), and masses from 5 to 5​1⁄4 oz. (142 to 149 g). The yarn or string used to wrap the baseball can be up to one mile (1.6 km) in length. Some are wrapped in a plastic-like covering. A significant quality of the baseball is the stitching that holds together the covering of the ball. After a ball has been pitched, these raised stitches catch the air and cause the ball to swerve slightly on its way to the catcher. Whether the ball swerves to the right, to the left, downward, or a combination thereof, and whether it swerves sharply or gradually, depends on which direction, and how fast, the stitches have been made to spin by the pitcher. See, for example, curveball, slider, two-seam fastball, four-seam fastball, sinker, cutter. In the early, mid-1800s days of baseball, there was a great variety in the size, shape, weight, and manufacturing of baseballs. Early baseballs were made from a rubber core from old, melted shoes, wrapped in yarn and leather. Fish eyes were also used as cores in some places. Pitchers usually made their own balls, which were used throughout the game, softening and coming unraveled as the game went on. One of the more popular earlier ball designs was the "lemon peel ball," named after its distinct four lines of stitching design. Lemon peel balls were darker, smaller, and weighed less than other baseballs, prompting them to travel further and bounce higher, causing very high-scoring games. In the mid-1850s, teams in New York met in attempt to standardize the baseball. They decided to regulate baseballs to weighing between 5.5–6 oz and having a circumference of 8–11 inches. There were still many variations of baseballs since they were completely handmade. Balls with more rubber and a tighter winding went further and faster (known as "live balls"), and balls with less rubber and a looser winding (known as "dead balls") did not travel as far or fast. This is generally true for all baseballs. Teams often used this knowledge to their advantage, as players from the team usually manufactured their own baseballs to use in games. There is no agreement on who invented the commonplace figure-8 stitching on baseballs. Some historians say that it was invented by Ellis Drake, a shoemaker's son, to make the cover stronger and more durable. Others say it was invented by Colonel William A. Cutler and sold to William Harwood in 1858. Harwood built a factory in Natick, Massachusetts, and was the first to popularize and mass-produce baseballs with the figure-8 design. In 1876, the National League (NL) was created, and standard rules and regulations were put in place. A.G. Spalding, a well-known baseball pitcher who made his own balls, convinced the NL to adopt his ball as the official baseball for the NL. It remained that way for 100 years. In 1910, the cork-core ball was introduced. They outlasted rubber core baseballs; and for the first few years they were used, balls were hit farther and faster than rubber core balls. It eventually went back to normal. Pitchers adapted with the use of the spitball, which is now illegal, and an emphasis on changing the ball. In 1920, a couple of important changes were made to baseballs. They began to be made using machine winders and a higher grade of yarn from Australia. Although there was no evidence that these balls impacted the game, offensive statistics rose throughout the 1920s, and both players and fans believed that the new balls helped batters hit the ball farther. In 1925, Milton Reach patented his "cushion cork" center. It was a cork core surrounded by black rubber, then another layer of red rubber. In 1934, The National League and American League came to a compromise and standardized the baseball. They agreed on a cushion cork center; two wrappings of yarn; a special rubber cement coating; two more wrappings of yarn; and, finally, a horsehide cover. Baseballs have gone through only a few small changes since the compromise. During World War II, the US banned the use of rubber for non war-related goods, including for baseballs. So in 1943, instead of using rubber, baseballs were made with rubberlike shells of balata; a substance, obtained from a particular type of tropical tree, that was also used in golf balls. Hitting declined significantly in 1943. The introduction of synthetic rubber in 1944 resulted in baseballs returning to normal. Offense would return to normal after the change back to the regular ball and return of players from active duty. In 1974, baseballs covers were switched from horsehide to cowhide. In 1976, MLB stopped using Spalding for manufacturing their baseballs and started using Rawlings. 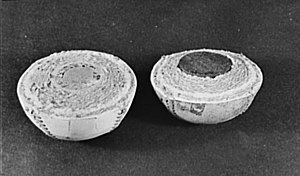 Halves of two baseballs, illustrating the composition of the balls. On the left, a traditional cork-centered ball, and on the right, a rubber-centered ball. Cushioned wood cores were patented in the late 19th century by sports equipment manufacturer Spalding, the company founded by former baseball star A.G. Spalding. In recent years, various synthetic materials have been used to create baseballs; however, they are generally considered lower quality, stiched with two red thick thread, and are not used in the major leagues. Using different types of materials affects the performance of the baseball. Generally a tighter-wound baseball will leave the bat faster, and fly farther. Since the baseballs used today are wound tighter than in previous years, notably the dead-ball era that prevailed through 1920, people often say that the ball is "juiced". The height of the seams also affects how well a pitcher can pitch. Generally, in Little League through college leagues, the seams are markedly higher than balls used in professional leagues. In the early years of the sport, only one ball was typically used in each game, unless it was too damaged to be usable; balls hit into the stands were retrieved by team employees in order to be put back in play, as is still done today in most other sports. Over the course of a game, a typical ball would become discolored due to dirt, and often tobacco juice and other materials applied by players; damage would also occur, causing slight rips and seam bursts. This would lower the offense during the games giving pitchers an advantage. However, after the 1920 death of batter Ray Chapman after being hit in the head by a pitch, perhaps due to his difficulty in seeing the ball during twilight, an effort was made to replace dirty or worn baseballs. In 1909, sports magnate and former player Alfred J. Reach patented the ivory centered "ivory nut" in Panama and suggested it might be even better in a baseball than cork. However, Philadelphia Athletics president Benjamin F. Shibe, who had invented and patented  the cork centered ball, commented, "I look for the leagues to adopt an 'ivory nut' baseball just as soon as they adopt a ferro-concrete bat and a base studded with steel spikes." Both leagues adopted Shibe's cork-centered ball in 1910. The official major league ball is made by Rawlings, which produces the stitched balls in Costa Rica. Attempts to automate the manufacturing process were never entirely successful, leading to the continued use of hand-made balls. The raw materials are imported from the United States, assembled into baseballs and shipped back. Throughout the 20th Century, Major League Baseball used two technically identical but differently marked balls. The American League had "Official American League" and the American League's president's signature in blue ink, while National League baseballs had "Official National League" and the National League president's signature in black ink. According to Bob Feller, in the 1930s, when he was a rookie in the National League, baseball laces were black, intertwined with red; the American League's were blue and red. In 2000, Major League Baseball reorganized its structure to eliminate the position of league presidents, and switched to one ball specification for both leagues. Under the current rules, a major league baseball weighs between 5 and 5 1⁄4 ounces (142 and 149 g), and is 9 to 9 1⁄4 inches (229–235 mm) in circumference (2 7⁄8–3 in or 73–76 mm in diameter). There are 108 double stitches on a baseball, or 216 individual stitches. Today, several dozen baseballs are used in a typical professional game, due to scratches, discoloration, and undesirable texture that can occur during the game. Balls hit out of the park for momentous occasions (record setting, or for personal reasons) are often requested to be returned by the fan who catches it, or donated freely by the fan. Usually, the player will give the fan an autographed bat and/or other autographed items in exchange for the special ball. Balls used in the professional game are rubbed with a mud known as "rubbing mud", which is typically applied by the umpire before each game, and is intended to help the pitcher's grip. There are different types of baseball used. The ball that Mark McGwire hit for his 70th home run of the 1998 baseball season, then setting a new record, was sold by a fan to Todd McFarlane for US$3.2 million at auction. Larry Ellison, not to be confused with the software entrepreneur of the same name, famously retrieved both Barry Bonds's 660th and 661st home runs. Barry Bonds's 73rd home run of the 2001 season. It was the last home run of his historic, record breaking season where he broke Mark McGwire's single season home run record. Ownership of the ball generated controversy and litigation resulted between the two people that claimed to have caught it. The story was made into a documentary, Up for Grabs. It was sold in auction to Todd McFarlane for $450,000. Barry Bonds's record-breaking 756th home run, beating Hank Aaron's record, caught by a New York Mets fan in 2007. It was later sold at an online auction for more than $750,000 to Marc Eckō, a New York fashion designer. Derek Jeter's 3,000th hit, a home run, was caught by a New York Yankees fan who gave the ball back to the Yankees and was rewarded with about $70,000 worth of gifts and memorabilia. Roger Maris's 61st single-season home run was caught barehanded by a truck driver. The ball was sold at the price of $5,000. Babe Ruth's home run in the 1933 MLB All-Star Game sold for over $800,000. It was also signed by him. Hank Aaron's 755th home run ball sold for $650,000 at auction in 1999. The ball was kept in a safety deposit box for 23 years after groundskeeper Richard Arndt was fired from the Milwaukee Brewers for not returning the ball, even though he had attempted to the previous day. A baseball signed by both Joe DiMaggio and Marilyn Monroe (who were married for less than a year) in 1961 during spring training in Florida sold for $191,200 in auction. The ball that rolled between Bill Buckner's legs during the 1986 World Series sold for $418,250 at auction in July. This was the play that forced a game 7 with the New York Mets and caused the Boston Red Sox to ultimately lose the series. Steve Bartman interfered with a play while attempting to catch a foul ball, causing the Chicago Cubs not to get an out in "The Inning" during the 2003 NLCS. The loose ball was snatched up by a Chicago lawyer and sold at an auction in December 2003. Grant DePorter purchased it for $113,824.16 on behalf of Harry Caray's Restaurant Group. On February 26, 2004, it was publicly exploded in a procedure designed by Cubs fan and Academy Award winning special effects expert Michael Lantieri. In 2005, the remains of the ball were used by the restaurant in a pasta sauce. While no part of the ball itself was in the sauce, the ball was boiled in water, beer, vodka, and herbs and the steam captured, condensed, and added to the final concoction. Cricket ball—ball as used in cricket of similar construction (cork center wrapped tightly with string and encased in leather with a raised sewn seam of stitches by the "equator" of the ball). ^ "2014 Official Baseball Rules" (PDF). Retrieved 2014-12-29. ^ a b c d e f Stamp, Jimmy. "A Brief History of the Baseball". smithsonian.com. Smithsonian. Retrieved 13 May 2015. ^ "Baseball (equipment)". baseball-reference.com. Retrieved 13 May 2015. ^ "BIG LEAGUES AGREE ON LIVELIER BALL; Sphere Used in the American Last Year Is Accepted in Toto by the National". The New York Times. 1934-01-06. ISSN 0362-4331. Retrieved 2017-03-22. ^ a b c Rymer, Zachary D. "The Evolution of the Baseball From the Dead-Ball Era Through Today". Bleacher Report. Retrieved 2017-03-22. ^ "Baseball Bat Reviews of 2017 (BBCOR Certified Bats)". BaseballRace. Retrieved 2017-03-22. ^ Deford, Frank (8 August 2005). "Rapid Robert Can Still Bring It". Sports Illustrated. pp. 3 (of 11). Retrieved 15 July 2013. ^ Schneider, Jason (2006-07-04). "All-American mud needed to take shine off baseballs". The Florida Times-Union. Retrieved 2009-10-06. ^ Grunwald, Michael. "McFarlane Paid $3 Million for McGwire's 70th Home Run Ball". tech.mit.edu. The Washington Post. Retrieved 8 June 2015. ^ Sanchez, Marcio Jose. "Fan who catches No. 660 ball also gets 661". usatoday.com. USA TODAY. Retrieved 8 June 2015. ^ Berkow, Ira. "BASEBALL; 73rd Home Run Ball Sells for $450,000". nytimes.com. New York Times. Retrieved 8 June 2015. ^ Curry, Jack. "Bonds Hits No. 756 to Break Aaron's Record". nytimes.com. NY Times. Retrieved 8 June 2015. ^ "Barry Bonds Record-Breaking 756 Home Run Ball Sold for $752,467.20". psacard.com. Collectors Universe. Retrieved 8 June 2015. ^ Matuszewski, Erik. "Jeter Fan Who Returned Baseball Leaves $180,000 on Table to Do Right Thing". Bloomberg. Retrieved 10 February 2012. ^ Daily, The. "Derek Jeter's 3,000th Hit, Mark McGwire's 70th Home Run, and More Most Valuable Baseballs". The Daily Beast. Retrieved 2013-07-16. ^ Rotstein, Gary. "Ruth home run ball brings in $700,000". post-gazette.com. Pittsburgh Post-Gazette. Retrieved 8 June 2015. ^ Roy, Ewan. "Top 10 Most Interesting Baseballs Sold at Auction". therichest.com. TheRichest.com. Retrieved 8 June 2015. ^ "Ball signed by DiMaggio and Monroe breaks bank". espn.com. ESPN. Retrieved 8 June 2015. Major League Baseball: Official Rules: 1.00 Objectives of the Game See 1.09. Wikimedia Commons has media related to Baseballs.